AGM, Networking Luncheon and talk by Dr Martyn Bond, a Vice-President of CIOL. My first task is to extend a very warm welcome to all of you and to thank you sincerely for coming today. As I always say, without you there would be no Lincolnshire Society. Once again we would like to say a very sincere thank you to the Chief Executive and Staff of the Chartered Institute of Linguists for their continuing support and help during the past twelve months, and for our annual grant, which enables our Society to continue offering our programme of events and networking opportunities for members and prospective members. The financial arrangements are changing after this year, so we shall be funded direct from the Institute, rather than applying for a grant each year. Adam will probably explain the changes more fully when he gives his report. As always, I would like to thank hugely our Secretary, Lady Brigitte Peach, our Treasurer and Chartered Linguist, Adam Ramsey, and our Committee Members, Madeleine Cox, Helen Burlefinger and Kasia Cox, for all their support and work throughout the past year, which is greatly appreciated. We were proud that Adam served as a co-opted Member of Council for most of that year. 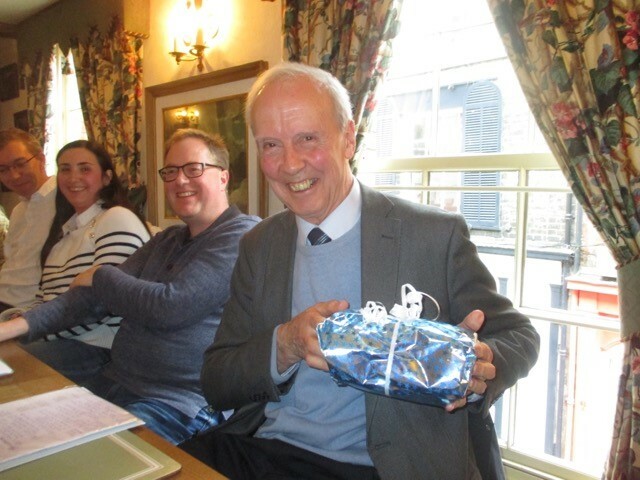 During the last twelve months we have had a varied series of events; on 14 May 2016 our AGM was followed by a Networking Lunch and ‘A Talk on China’ by Rodney Mantle FCIL, who lived and worked in China for ten years and still regularly returns. His interesting, illustrated talk was primarily about the China that few westerners see and he generously provided presents for everyone. On 19 November 2016 after a Networking Luncheon, Brigitte, who has run her own language agency for the last nine years and has been a language teacher since 1992, talked to us about 'The Challenges of Teaching Foreign Languages’; she spoke about teaching languages in schools, the English Baccalaureate, becoming a language teacher, the decline in modern foreign language examination entries and the fact that we need far more of our young people to learn languages in order to boost their own job prospects and to ensure that the UK stays competitive on the world stage. Our most recent event was on 4 February 2017. 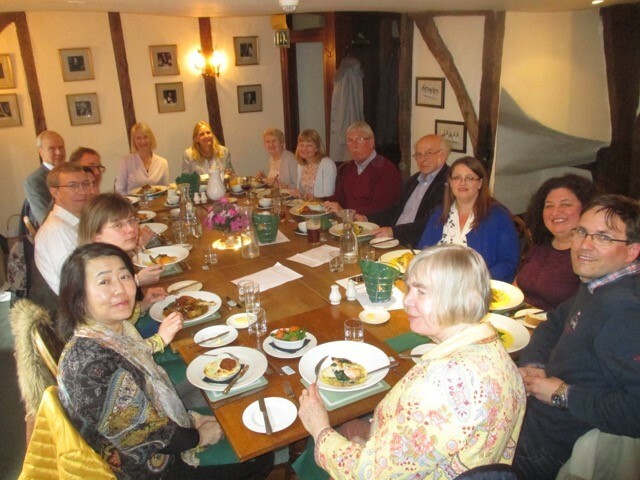 It was a Networking Luncheon when we were pleased to welcome Jane Galbraith, Head of Membership of CIOL. Jane talked to us about the benefits of membership of the Institute, applying for Chartered Linguist registration, strategies to attract a wider audience and to encourage people to become Members (the membership pathway) and CIOL’s plans for the future. Today we are greatly looking forward to welcoming our speaker, Dr Martyn Bond, Vice-President of the Chartered Institute of Linguists whose talk is entitled ‘Brexit in other languages’. Martyn Bond read Modern Languages at Queens' College, Cambridge from 1961 to 1964 and subsequently gained his doctorate at Sussex after studies there and in Hamburg. He began his career in the BBC, moved to the New University of Ulster to teach West European Studies in 1970, and in 1974 joined the press department of the General Secretariat of the EU Council of Ministers in Brussels. He moved to Berlin in 1981 as BBC Correspondent, returning to the Council of Ministers in 1983 where he was a senior administrator dealing with development issues and relations with the European Parliament. In 1989 he moved to London as Head of the Office of the European Parliament in the UK, a post from which he retired in 2000. From 2000 to 2004 he was Director of the Federal Trust for Education and Research.He is a Vice-President of the Chartered Institute of Linguists, Vice-Chairman of the London Press Club and Founder-Governor of the English College in Prague, a secondary school founded in 1994 teaching mainly Czech students through the medium of English. He is also an Honorary Research Fellow at Royal Holloway, University of London, and a Senior Honorary Fellow of Regent’s University, London, as well as a Senior Fellow of the Salzburg Seminar in Global Studies. Martyn has published several books on European Affairs. Currently he is a freelance lecturer, journalist, editor and author. We are delighted he has agreed to come and talk to us. Please do send us any ideas for topics for future events; we are always grateful for these. If anyone does not wish to be included in our publicity photographs, please let us know before the photographs are taken. I would like to thank all those who have attended our meetings during the past year and hope that you will all enjoy our event today. Martyn Bond read Modern Languages at Queens' College, Cambridge from 1961 to 1964 and subsequently gained his doctorate at Sussex after studies there and in Hamburg. He began his career in the BBC, moved to the New University of Ulster to teach West European Studies in 1970, and in 1974 joined the press department of the General Secretariat of the EU Council of Ministers in Brussels. He moved to Berlin in 1981 as BBC Correspondent, returning to the Council of Ministers in 1983 where he was a senior administrator dealing with development issues and relations with the European Parliament. In 1989 he moved to London as Head of the Office of the European Parliament in the UK, a post from which he retired in 2000. From 2000 to 2004 he was Director of the Federal Trust for Education and Research. He is a Vice-President of the Chartered Institute of Linguists, Vice-Chairman of the London Press Club and Founder-Governor of the English College in Prague, a secondary school founded in 1994 teaching mainly Czech students through the medium of English. He is also an Honorary Research Fellow at Royal Holloway, University of London, and a Senior Honorary Fellow of Regent's University, London, as well as a Senior Fellow of the Salzburg Seminar in Global Studies. Martyn has published several books on European Affairs. Currently he is a freelance lecturer, journalist, editor and author.